Many years back in 1987, after I was ordained by H.H the 14th Dalai Lama in Dharamsala, I travelled to Nepal to run some errands. During this trip, I stayed in a monastery in Nepal called Samtenling Monastery, and living in the room right next to mine was a Western monk. We eventually befriended each other because we both spoke English, and because the other monks had limited command of English which made communication difficult. So, in the few days that I got to know him, he kept telling me about his teacher, His Eminence Kyabje Gangchen Rinpoche, who would be visiting Nepal in two weeks time and that Gangchen Rinpoche would be staying close to Samtenling Monastery during his trip. At that time, I had never heard of Gangchen Rinpoche… I had not met him or read anything about him. Back in the 80s, there wasn’t much information at our disposal. There was no Internet or computers. So there were no avenues where you could do searches on the spot, and dissemination of information relied mostly on word of mouth. So, I told this monk that I would very much like to meet with Gangchen Rinpoche to receive his blessings. The monk said “OK” but when the much anticipated day of the audience with Gangchen Rinpoche arrived, the monk left to see his Lama… without me. And, not knowing where Gangchen Rinpoche would be, I could not find him. I was quite disappointed that day so I went for a walk in the capital of Kathmandu, in an area called Thamel, which is a well-known shopping district for tourists. Then, in the distance, I saw a taxi. In that taxi was a Tibetan monk with a long black beard sitting in the front. When I saw the taxi come my way, I hailed it. The bearded monk stopped the taxi when he saw me and opened the door… and, lo and behold, it was Gangchen Rinpoche! He said to me, “Who are you?” I said, “I don’t know, but I want to meet you.” He responded, “Ok, you come in the afternoon” and told me the location of his ladrang. The incredible thing was, I was supposed to meet Gangchen Rinpoche earlier that day. I wanted to meet him very much, but when my monk friend left to see his Lama without me, I just thought, “Well, I do not know where he lives, so never mind.” Yet, I ended up meeting him in the middle of a busy town! Also later that afternoon when I arrived at his house (ladrang), the minute I approached him, he told me a few things that were quite incredible, because I had never met this Lama… I had never seen, heard of or spoken to him… In fact, I had never even spoken to any of his students prior to my brief encounter with the Western monk. So, there I was in the middle of Kathmandu, Nepal and Rinpoche was telling me things about my past that were very accurate and precise. Gangchen Rinpoche also gave me a prediction of my future and what I should do in tremendous detail. Yes, I repeat: he gave me predictions of my future and what I should do in much detail. And in hindsight, 20 years later, it came true. So I am totally and perfectly convinced that Kyabje Gangchen Rinpoche has very advanced psychic abilities, which I witnessed with my own eyes. I was and am still amazed at the clairvoyance of Kyabje Gangchen Rinpoche. If you ever have a chance to visit him, you should. 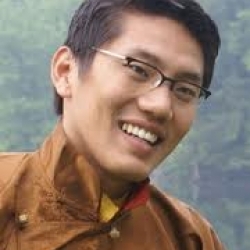 He is an incredible lama with great compassion, knowledge, insight and psychic abilities. He is a great healer in this incarnation as were his previous incarnations. 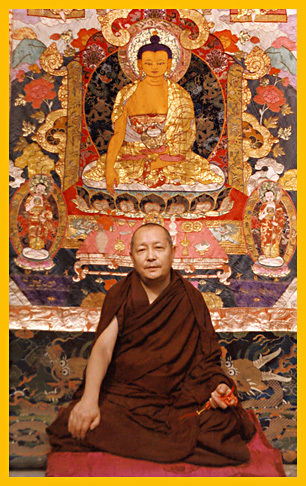 It is said Kyabje Gangchen Rinpoche has many visions of various Buddhas and Dharma protectors and is very close to H.H. Panchen Rinpoche for many lifetimes now. In the following years, whenever I went to Nepal or travelled to other places, Gangchen Rinpoche would always “happen to be there”. His home base is in Italy but he also has a Ladrang (Lama’s residence) in Nepal. Whenever I was in Nepal, he would always be at his Ladrang there. It was kind of a coincidence. During one of my visits to Nepal, I engaged in a Yamantaka retreat with Gangchen Rinpoche and his group of students. After the Yamantaka retreat, I was planning to return to Gaden in South India. However, Gangchen Rinpoche insisted that I go to India with him. With trepidation, I followed Gangchen Rinpoche and his large group of students to India from Nepal. We took a bus and among the many places that we visited was Domo Geshe Rinpoche’s monastery in Sikkim, Kalimpong, North India. We also visited Domo Geshe’s private residence. Gangchen Rinpoche respects Domo Geshe very much and the temples built by Domo Geshe in Kalimpong, Darjeeling and Sikkim are very sanctified and holy. 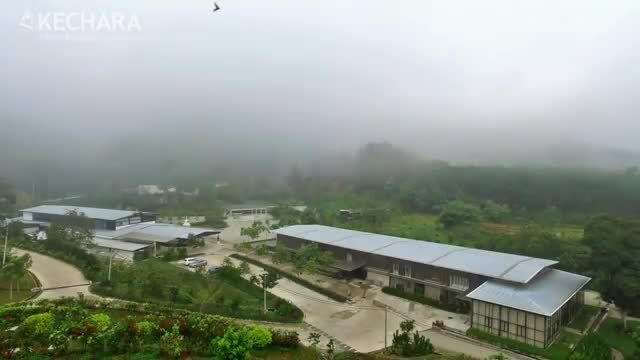 Many of Domo Geshe Rinpoche’s students live in the area, and they manage and take care of the temple and the residences perfectly. I am so glad I went along with Rinpoche and he invited me. 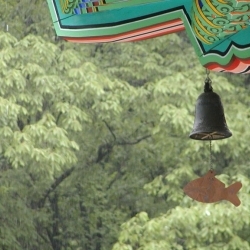 During my visit to Domo Geshe’s monastery, I stayed in an oracle’s house in Kalimpong. Domo Geshe Rinpoche had a student in the monastery named Lhakpa Dhondrub, who was an oracle of Dorje Shugden and Namkar Barzin as well as Setrap. I stayed with Lhakpa Dhondrub in his home, and he joined Gangchen Rinpoche and the entourage as we traveled around North India. I remember a particular incident that occurred while we were visiting the monasteries of Domo Geshe Rinpoche… I experienced an incredible feeling as I entered one of the Protector Chapels. 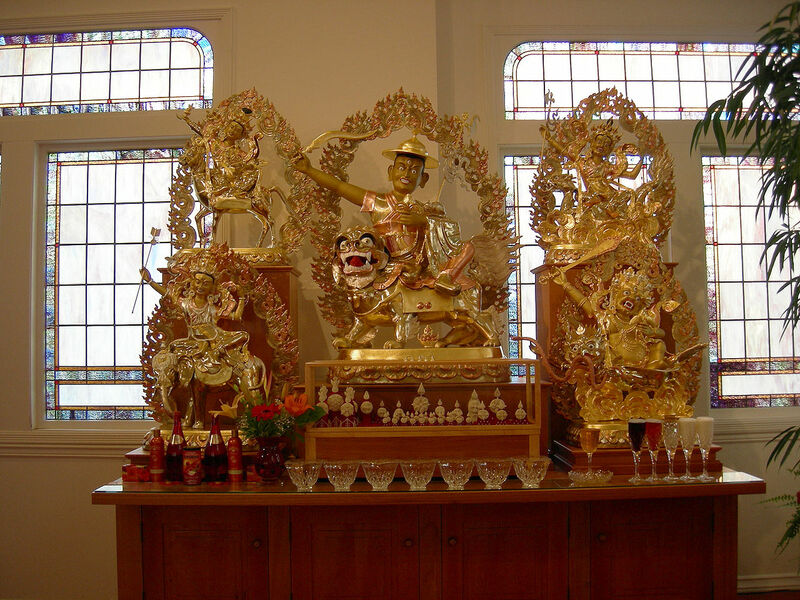 Domo Geshe had Dorje Shugden and several other Protectors in the Protector Chapel but I was very attracted to one particular Protector, which Gangchen Rinpoche introduced to me as Namkar Barzin. Lhakpa Dhondrub spontaneously took trance of Namkar Barzin and embraced Kyabje Gangchen Rinpoche when we visited this temple. I met Namkar Barzin at this time and offered a khata. I was in awe and entranced. I was so excited to meet a Protector through this famous oracle. Namkar Barzin embracing Kyabje Gangchen Rinpoche showed their closeness and how highly attained Kyabje Gangchen Rinpoche is. During the Monlam Festival, which was started by Je Tsongkhapa in Lhasa during his lifetime on earth, everyone would go out for days to commemorate the New Year. The festivities would culminate in the celebration of the coming of Maitreya Buddha. 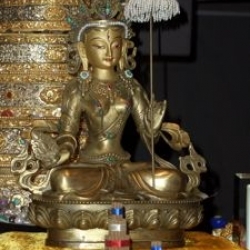 Maitreya’s statue would be escorted through the crowd that was gathered in the streets of Lhasa, and tens of thousands of people would go and make offerings to Maitreya Buddha to make a connection with him for the future. 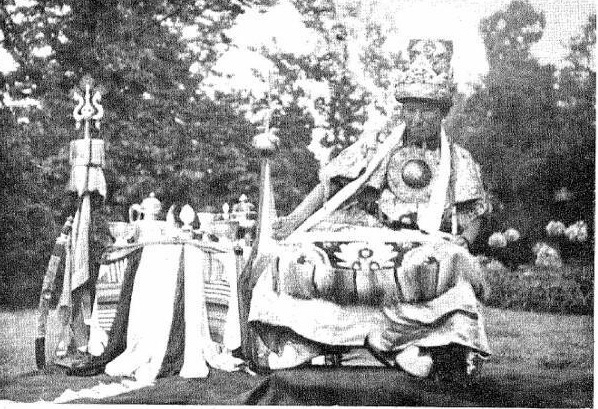 There was a Mongolian Geshe who attended the Monlam Festival in the 1920’s. On his way back to Mongolia after the festivities, he passed through Phari, an area of Domo Geshe’s monasteries. At that time, the roads were not paved as they are today, and travelling was very treacherous. There were no vehicles either, and the only way to travel was by horse or caravan or on foot. So, while the Geshe was walking and hitch hiking back to Mongolia, he got caught in a snowstorm in Phari. And by the time the snowstorm was over, the Geshe had literally frozen into a block of ice. He was at death’s door – nearly dead but his consciousness was still present. He was ‘kind of’ frozen in a walking position – standing in a block of ice – and his eyes were wide open. When the local kids passed by and saw the Mongolian Geshe frozen in the block of ice, they started taunting and making fun of him and, basically, laughed at his predicament. These insensitive acts were done while the Geshe’s consciousness was still inside his body, and through his eyes he could see what these kids were doing, i.e. taunting him instead of getting him help. He became very disturbed and passed away unhappy. After the Geshe’s unhappy death, animals in the region started to fall ill and die… the weather conditions became unusual… bad omens and signs started to appear.. and the families of the children who had taunted the Geshe started to develop illnesses that could not be cured with medicine. These events worried and frightened the people of the region, so they consulted with Kyabje Domo Geshe Rinpoche, who was the most respected Lama in the area at that time. After listening to the villagers’ problems, Domo Geshe Rinpoche knew exactly what had happened… he understood and decided to talk to the Geshe. When Domo Geshe Rinpoche asked the Geshe’s corpse this question, everybody present saw the corpse blink his eyes in acceptance. 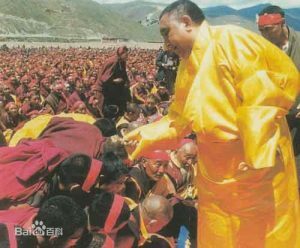 After that, Domo Geshe had his oracle of Dorje Shugden take trance, and he officially offered the Geshe (now known as Namkar Barzin) to Dorje Shugden to be part of his entourage. 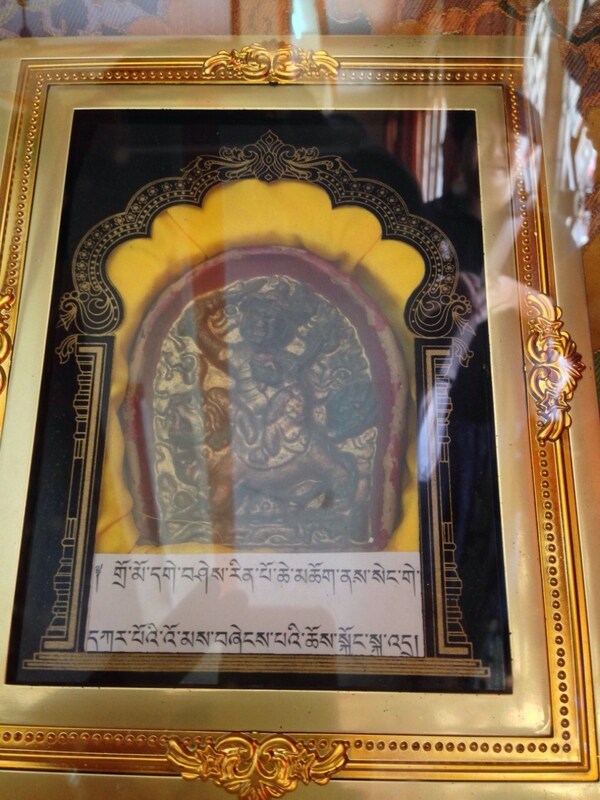 Dorje Shugden accepted and Namkar Barzin’s promise to Dorje Shugden was sealed. 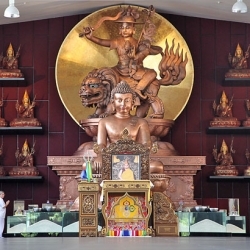 As Dorje Shugden is a highly realized being, it was appropriate for Namkar Barzin to assist him. He along with Kache Marpo serves as one of the main ministers of Dorje Shugden. Namkar Barzin showed a lot of effort in helping Dorje Shugden, helping Dharma practitioners, protecting the monasteries and gave a lot of signs. If a lama of Domo Geshe Rinpoche’s caliber recognizes this new protector Namkar Barzin, it is good enough for me. Domo Geshe was very pleased with Namkar Barzin, and made many images of him and spread his practice to many. Domo Geshe also enthroned Namkar Barzin as one of the protectors of his many monasteries. 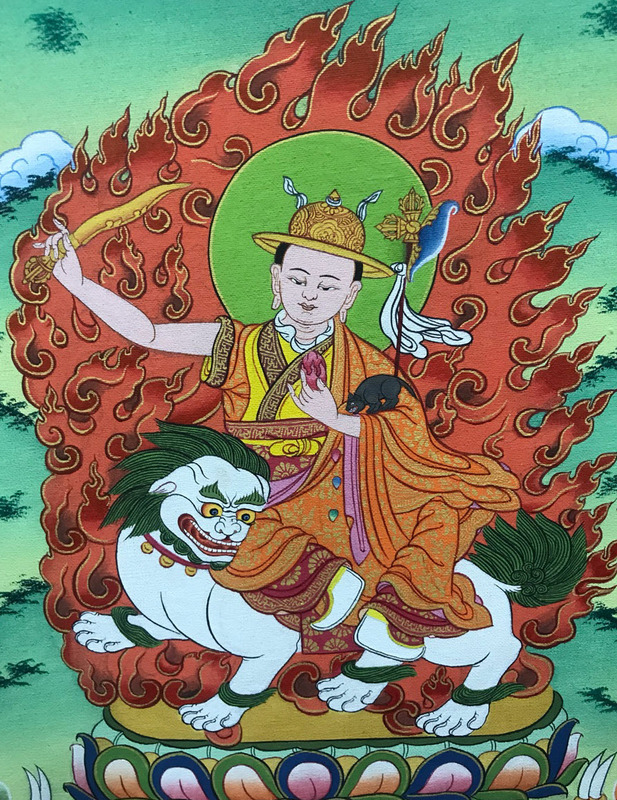 Although he is part of Dorje Shugden’s entourage, Namkar Barzin is a Dharma Protector in his own right and there are rituals, rites and mantras written to Namkar Barzin that specifically invoke his presence, power and blessings. In the Phari area, Namkar Barzin is very famous and very well known. Up till today, the people of Phari practice this Dharma Protector very strongly. I found this to be very interesting and captivating and thought I should share the story here. 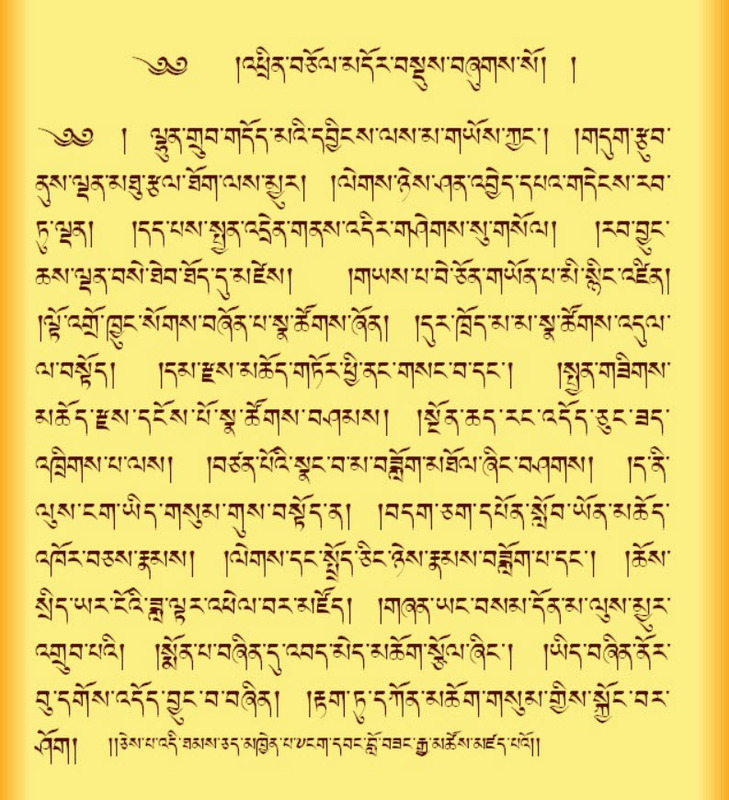 Below are the prayers to Namkar Barzin. 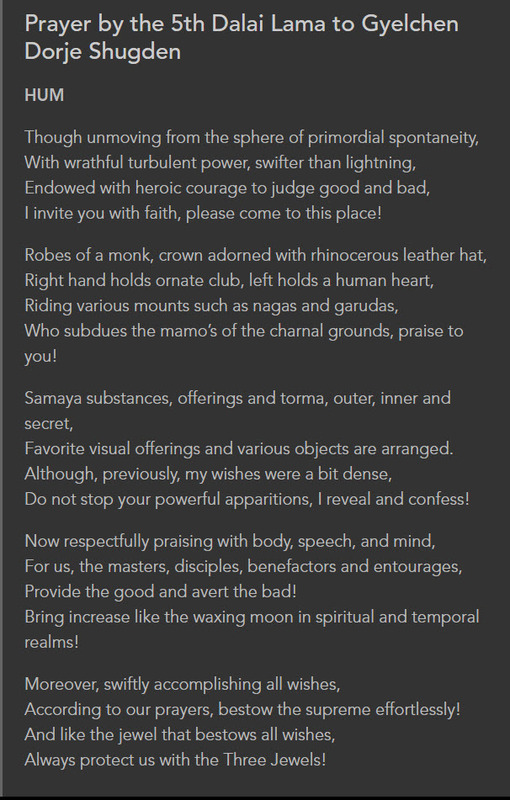 I have personally composed a prayer to him because I feel a very strong connection to Namkar Barzin and a very strong liking for him because he can benefit people spiritually. 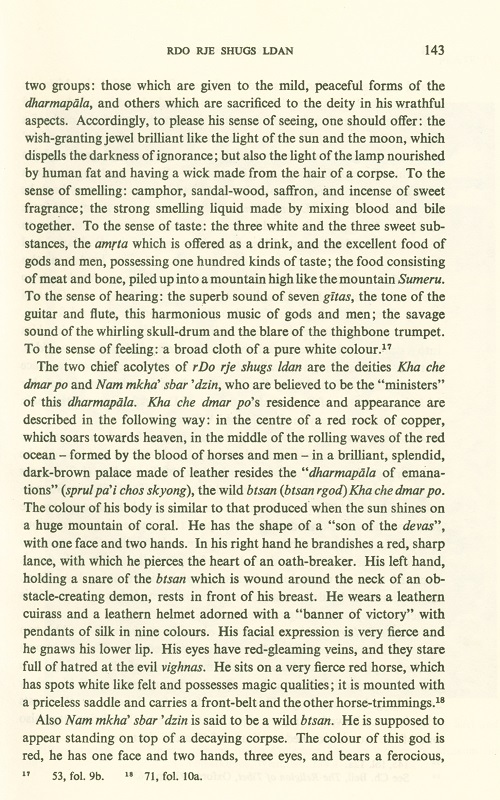 The mantra was extracted from traditional sources. 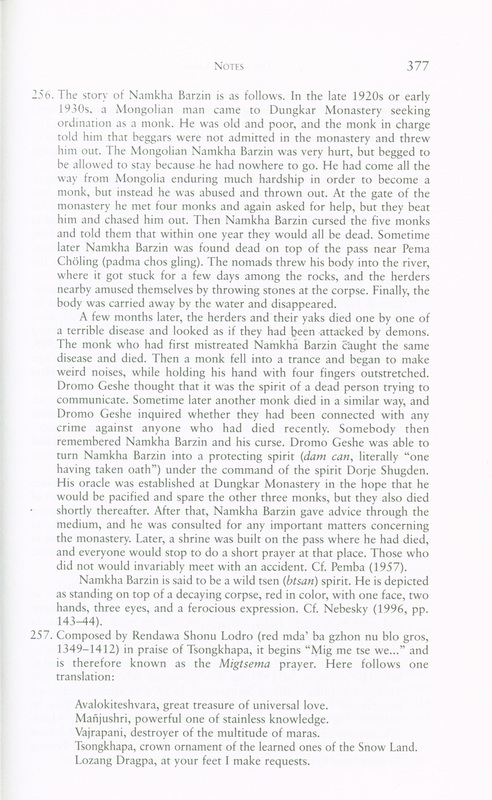 In Lama Zopa’s biography ‘The Lawudo Lama‘, he talks about Namkar Barzin, which is quite beautiful. I have extracted it here for you to see. 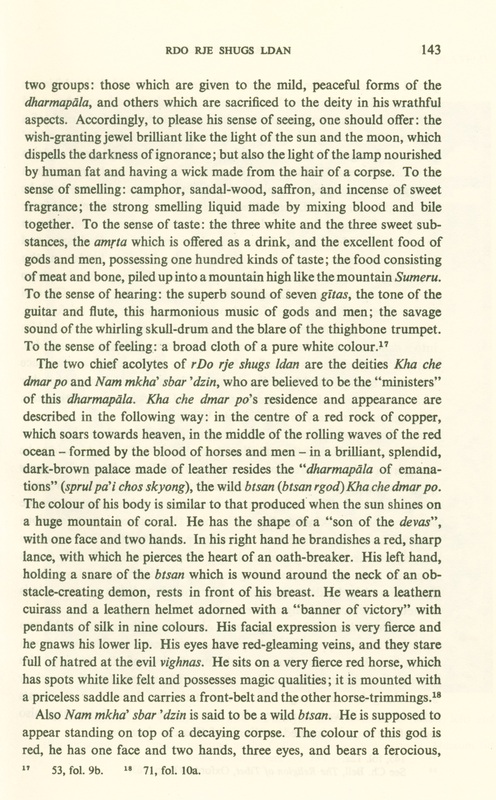 Also included are extracts from another book ‘Oracles and Demons of Tibet‘ which was written back in the 1950s and published in 1993 (pages 143 – 144). I have also included some different pictures and downloads for all of you. 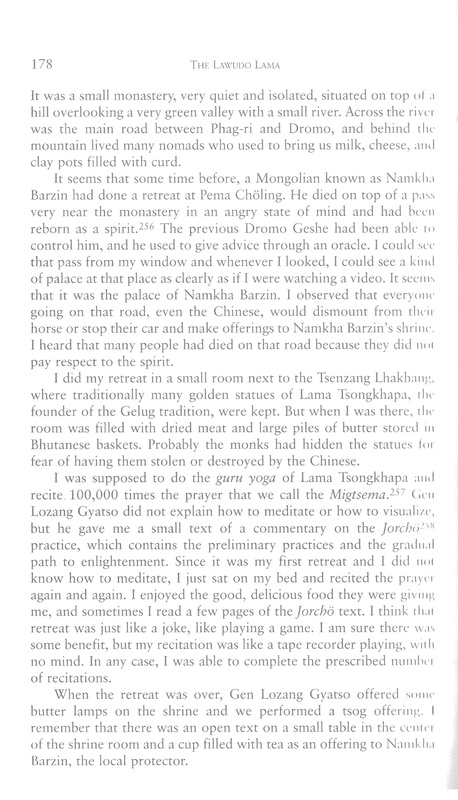 So, this is the short story of Namkar Barzin and I was first introduced to him by Kyabje Gangchen Rinpoche. He is a relatively new Dharma Protector who has been around for 70-80 years. Although he is new, he is very effective. As a footnote, which is quite interesting: while I was in Kalimpong, Domo Rinpoche’s oracle took trance of Namkar Barzin. When Namkar Barzin entered and spoke, the funny thing is he speaks in Mongolian and then he switches to Tibetan. The oracle himself is Tibetan who does not speak any Mongolian but when Namkar Barzin enters the oracle, he actually speaks Mongolian first before switching back to Tibetan. 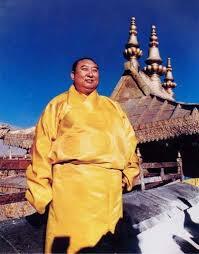 This is because before he passed away and became a Protector, he was a Mongolian Geshe. 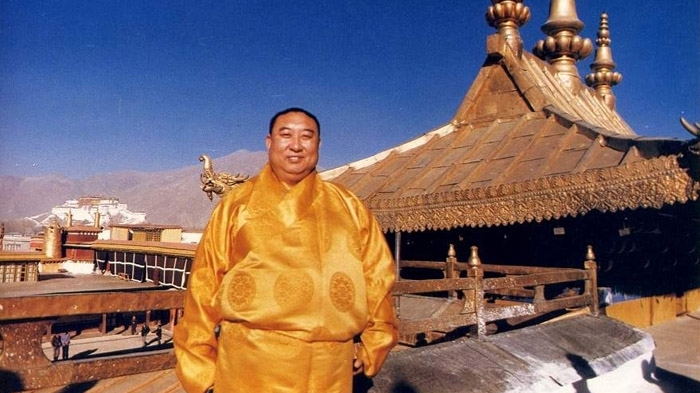 So, I met Namkar Barzin once through the oracle and I was introduced to him by Gangchen Rinpoche. I treasure all these wonderful memories and thought I would share it here. And who rides on a mystical qiling as a mount, showing your tantric masteries. In this region in which you are invoked. Many here are suffering unnecessarily. Please calm the violence and hostilities here. Protect those without help and assistance. Let disturbing violence in this area stop. Of the oath you have taken with the great Mahasiddha of Phari, Dromo Geshe Rinpoche. Offerings as to make a link with you. Accept and make this whole area at peace, prosperous and calm. Use your quick powerful actions and show immediate protection that is ongoing. Remain as my Dharma protector and calm interferences. May I be blessed by the faultless Shakyamuni, Tsongkhapa, and Dromo Geshe in this life and all future lives. Where there is unhappiness and sufferings, may it quell and be calmed. May I be of tremendous benefit to others and a fully enlightened being. The Lawudo Lama presents two life stories along with an extended introduction laying out their social and cultural context. 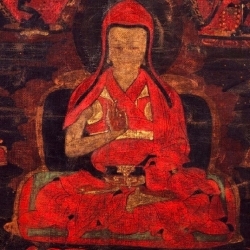 The first Lawudo Lama portrayed, Lama Kunzang Yeshe (1864-1946), was a yogi of the Nyingma lineage who spent much of his life meditating in a cave near Lawudo. 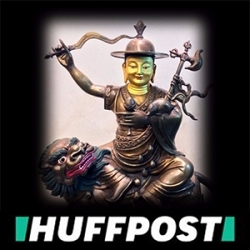 The second story is of Kunzang Yeshe’s reincarnation, a monk of the Gelug lineage known as Lama Zopa Rinpoche, whose story is given in a first-person narrative. 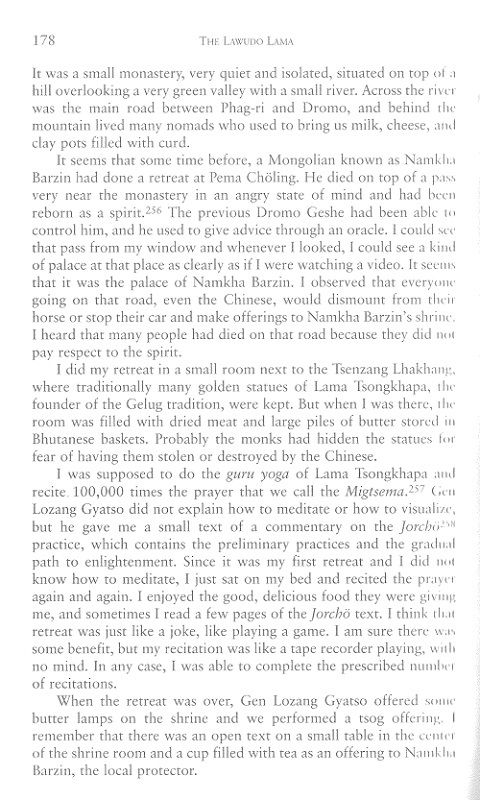 In this book, Lama Zopa mentions Namkar Barzin when recounting his visit to Dungkar Monastery. 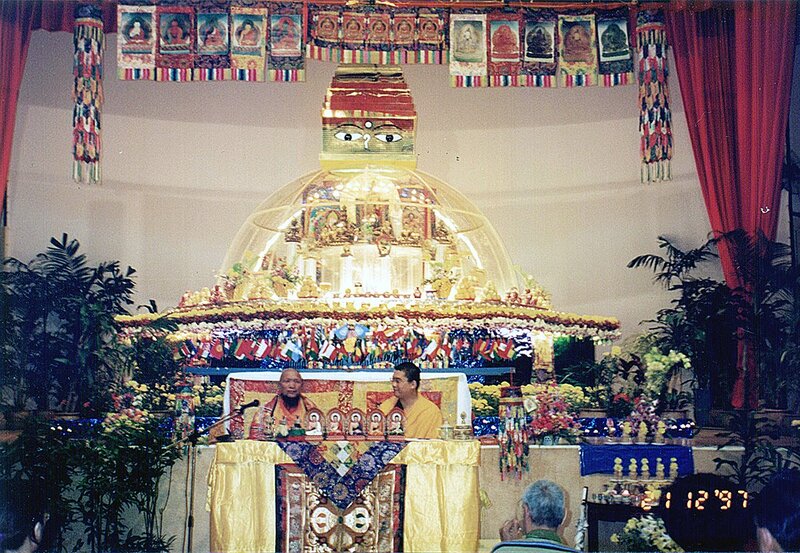 His Eminence Kyabje Gangchen Rinpoche and myself in my ladrang in Gaden Monastery back in 1994. I had the great fortune that Rinpoche visited me in my own home. This is the special oracle of Kyabje Domo Geshe Rinpoche who would take trance of Namkar Barzin whom I have met. Very holy Dorje Shugden image made personally by Kyabje Domo Geshe Rinpoche. 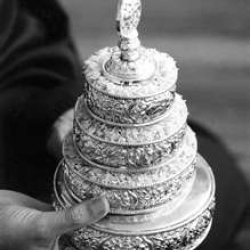 It was seen that Yetis used to bring snow lion milk to Domo Geshe Rinpoche as an offering. Snow lion milk was considered very medicinal and Domo Geshe had mixed the milk into the making of this image. 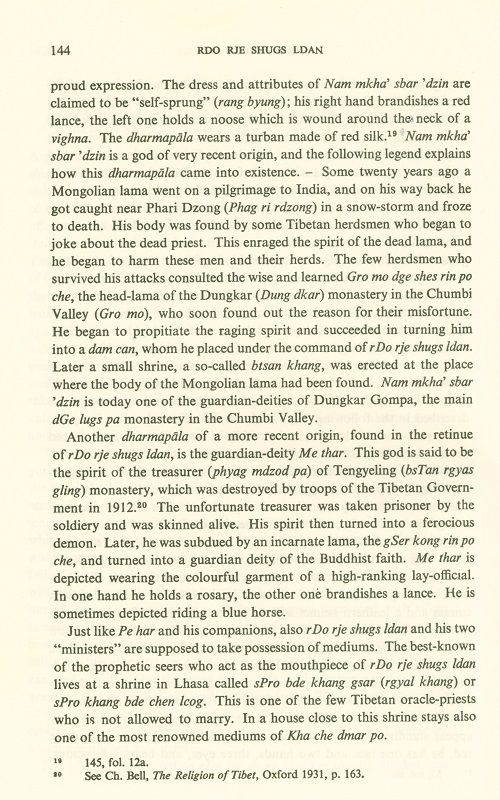 Yetis in Tibet were messengers between high lamas. Kind of like carrier pigeons. They are considered very intelligent. 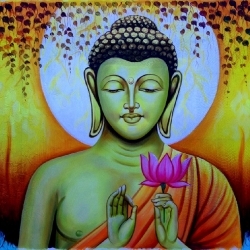 Just asking out of curiosity, in Buddhism there is many said mantras and protectors which is said to be able to protect and avert a person from harm. If the great Namkar Barzin was previously known as a powerful monk, why did such misfortune happened on him? I’ve also heard many stories that those who take refuge under Buddha/Lama are protected against harms and divine being will come to help in times of distress. But why did the misfortune still happened? Could someone please enlighten me with the knowledge of Buddhism as I’m still green in it? Appreciate it alot. Thankyou. 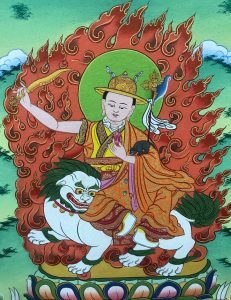 I love this story of how Namkar Barzin became a Minister in the entourage of Lord Dorje Shugden. It really shows the importance of Dharma that we hold within us that even under terrible conditions, an attained Lama like Kyabje Domo Geshe Rinpoche is able to change the course to be meritorious. It gives hopes that if we practiced well, our attained Guru will be able to help us. 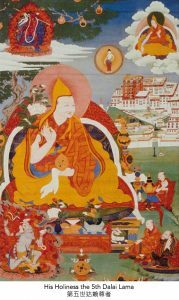 This story also shows the existence of attainments in Lamas/Masters who had gained high realisations/enlightenment in their spiritual practices and the possibility for us to achieve the same. It seems so magical and yet a reality that is so recent (70-80 years ago), during the times of my grandparents. Namkar Barzin with such close affinity with us can help us with swift and powerful results. 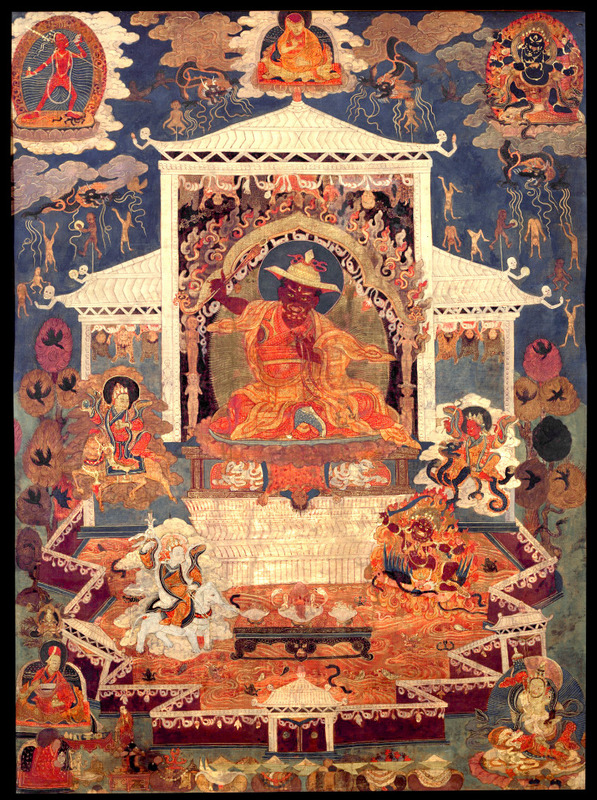 I love the story of Namka Barzin because it is a real story of how an ordinary spirit was allowed the great fortune to redeem himself by entering and serving within the mandala of Dorje Shugden. I think it is a universal tale of redemption that touches the core of our very being. All of us make mistakes and appreciate forgiveness and I think that’s what’s so appealing about Namka Barzin’s story and how we relate as half-past-six practitioners ourselves seeking to deepen our practice. In many ways, we are just like Namka Barzin seeking a second chance to make things right. Also, the thought of being a minister to an enlightened Dharma Protector is really appealing for its promise of fast-paced track to enlightenment. Domo Geshe, is so skillful to convert a raging spirit into part of Dorje Shugden entourage. As for a protector to arise it seems anger is one of the components and as more learned and spiritual beings are practiced it is even harder for conditions like anger to appear in their mindstreams. 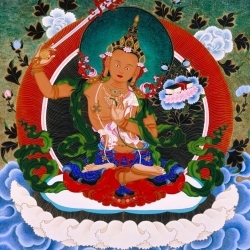 Because of Namka Barzin’s ability to benefit ladrangs of teachers and so forth may this practice spread so many more ladrangs are guarded by Namkar Barzin. As Tsem Rinpoche said, “When we do Dorje Shugden practice,then Namka Barzin is automatically included, because Dorje Shugden has many incredible beings on his entourage assisting him in his Dharma work always!” As Dorje Shugden is a highly realized being, it was appropiate for Namkar Barzin to assist him. 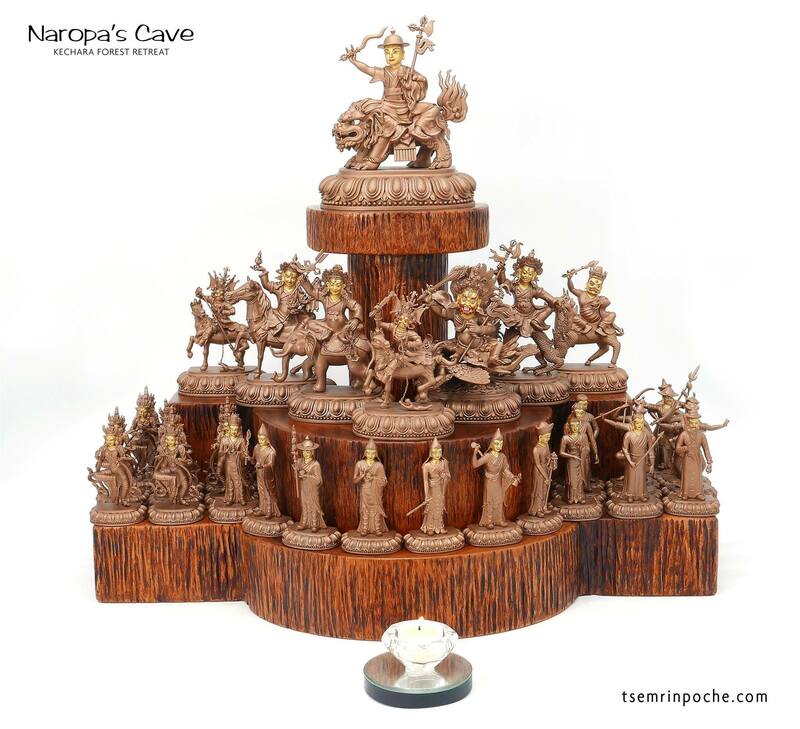 He alone with Kache Marpo is said to serve as one of the main ministers of Dorje Shugden. 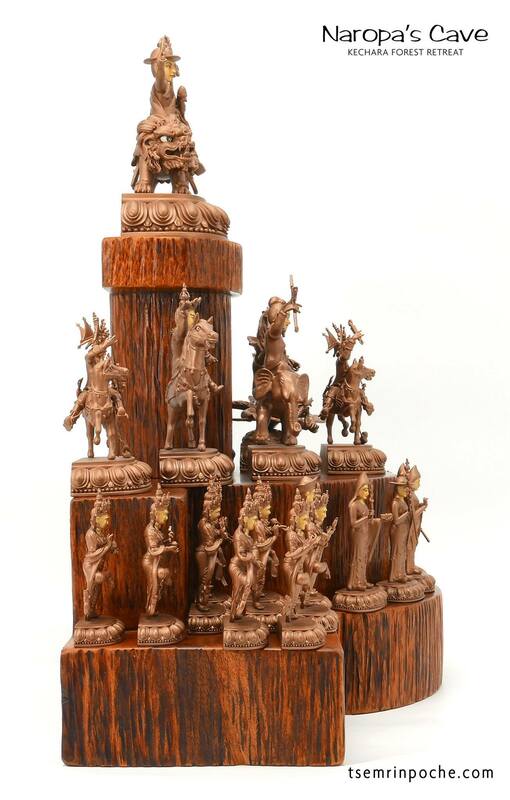 It is noted that people of Phari practised this Dharma protector very strongly, and that Namkar Barzin is said to be very famous and well-known in this Pari area. Before the “mongolian geshe” became “Namkar Barzin,” he got caught-up in a snow-storm in Pari, literally frozen into a block of ice, with his eyes still wide opened! 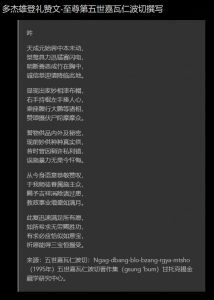 After the geshe unhappy frozen death, a lot of bad omens and signs started to appear with families of people and animals, who had taunted him, started falling ill and passing away! This phenomena created fears, worries, and panicky amongst the frightened residents of the region, so they consulted the most respected Lama, who happened to be Dome Geshe Rinpoche. Upon listening, Rinpoche immediately understood and went to talk to the “Death-corpse Geshe” who can still blink his eyes! When he was in acceptance, Domo Geshe Rinpoche had his oracle of Dorshe Shugden took trance and officially offered geshe, now known as “Namkar Barzin” to Dorje Shugden to be part of his entourage. When Dorje Shugden accepted, Namkar Barzin’s promise to Dorje Shugden was sealed. He alone with Kache Marpo serves as one of the main ministers of Dorje Shugden. It was mentioned herein this blog, that our Rinpoche has met Namkar Barzin once through the oracle introduced by Ganchen Rinpoche, which our Rinpoche has treasured as wonder memories and happy thoughts! Thank you so much for the sharing, Rinpoche! When we have a High Lama as our Guru for guidance along our spiritual path, it is something that we need to be grateful for and pay great reverence to our Guru. 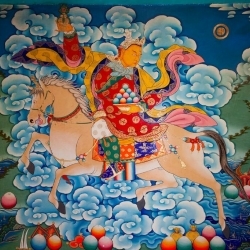 To the above, due to Namkar Barzin’s knowledge of Dharma, he agreed positively and he was saved from entry into the lower realms and reigns supreme as a member of the entourage of Dorje Shugden. 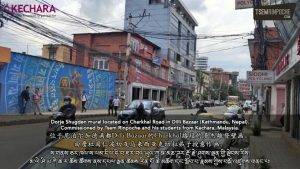 How Namkar Barzin became a member of Dorje Shugden’s entourage affirms the attainments of Kyabje Domo Geshe Rinpoche. How a monk who was lost in death but was subdued to protect dharma. To me, that is thegreatness of the dharma and all who has practiced the dharma cna be turned back to dharma and not continue being lost. From the story of Namkar Barzin, on how he passed away angrily, whereby a group of kid taunted him; thought came to me that I have to be mindful whenever we talk or deal with sentient beings. If we are careless, we could harm some one although it is not intentionally and causes lots of troubles. I too learned that, dharma is important not only for this life but the dharma knowledge could benefits us for many lifetimes. Namkar Barzin was a learned Geshe thus, his dharma knowledge have helped him to release from the suffering he have and become entourage of Dorje Shugden. By becoming entourage of Dorje Shugden, Namkar Barzin could continued to helps others by his dharma knowledge. 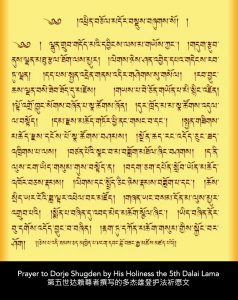 From the prayer wrote by Rinpoche, I learned that Namkar Barzin could calm down violence in that area, and also subjugate crime and thievery. At the same time, Namkar Barzin also guard on property and wealth. Thank you Rinpoche for sharing on this Protector. 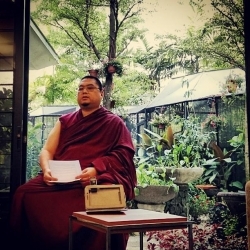 Thank you for sharing the background story of Namkar Barzin, Rinpoche. It is truly fascinating, and it enthralls me. As the arisen of Nambar Barzin as a protector was as recent as 90 years ago after being “subdued” by Domo Geshe Rinpoche, it goes to show that all the mystical and magical power of Tibetan Lamas are not a romanticized affair, but real and in fact, common. And we shall not take the spiritual strength of high lama lightly. From a different perspective, the sorry fate of the Mongolian Lama serves as a stern reminder that ignorance is NOT bliss. 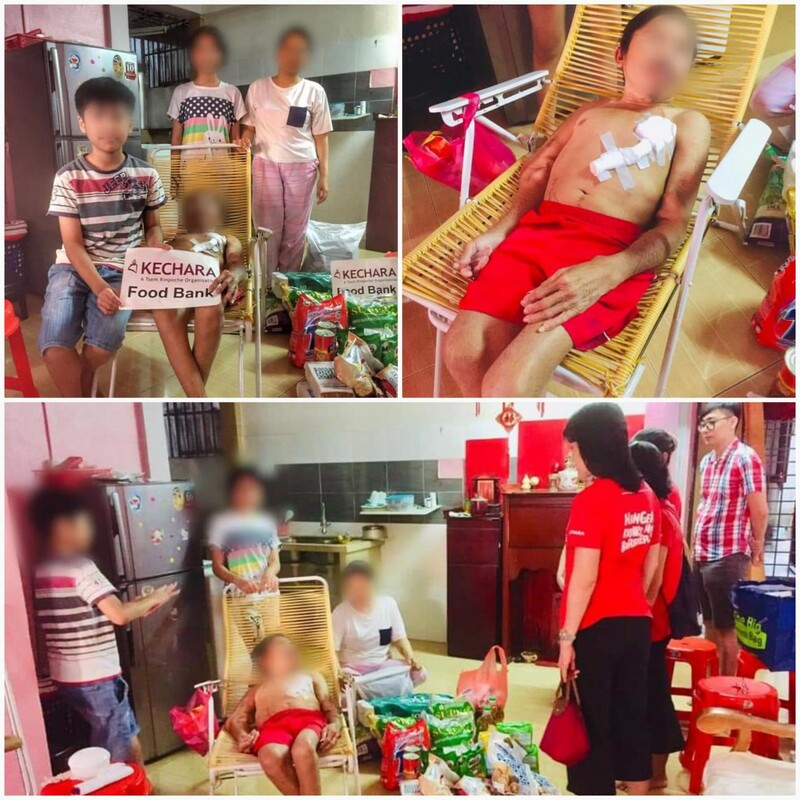 The ignorant and uncaring kids who taunted and mocked the Mongolian Lama when he was frozen instead of finding help created the karma for themselves as well as the people around them to suffer illness and terrible fate. Therefore it is better for us to know, to behave and to not act willfully. The outcome can be unthinkable If it is not for the powerful Kyabje Domo Geshe Rinpoche. 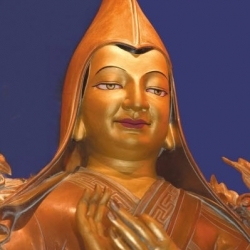 Interesting read of how Rinpoche came to know of this great master Kyabje Gangchen Rinpoche and Namkar Barzin through the oracle. Rinpoche’s meeting with Kyabje Gangchen Rinpoche and Domo Geshe Rinpoche were meant for each other so timely.I can understand now a bit more insight on Dorje Shugden entourage.Interesting read how Namkar Barzin how he arise as a protectoer,he was infact a Mongolian Geshe.He was one of the other powerful acolyte and entourage of Dorje Shugden. 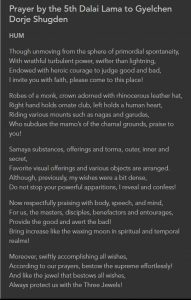 Thank you Rinpoche sharing this interesting story of Namkar Barzin and the invocation to Lord Namkar Barzin composed by Rinpoche. 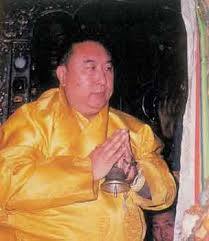 Namkar Barzin is considered as the newest member to join as Dorje Shugden’s entourage of about 70-80 years ago. He has similar function as Kache Marpo to serve as one of the main ministers of Dorje Shugden. 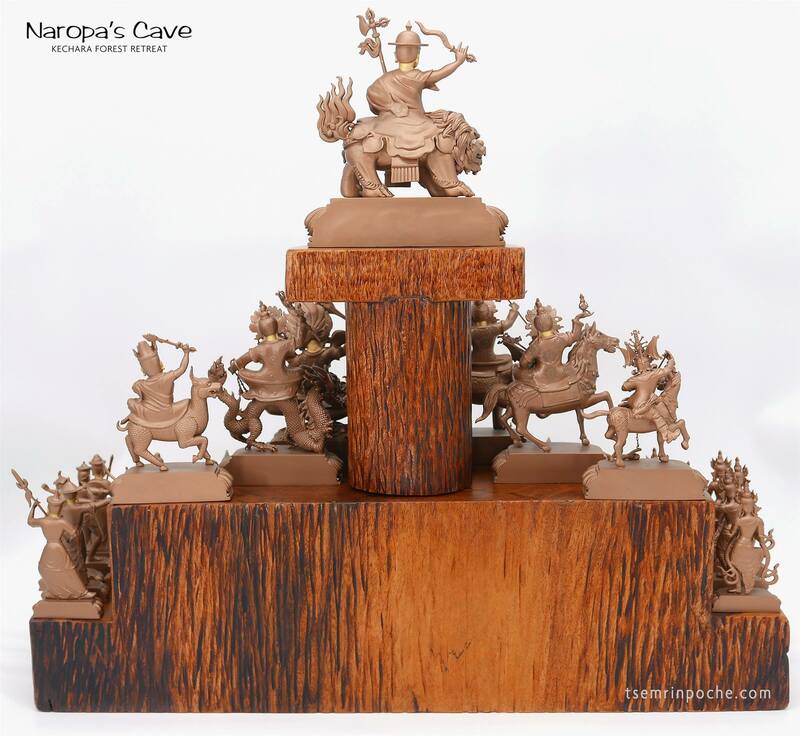 especially in helping Dharma practitioners to clear obstacles for smooth spiritual path. 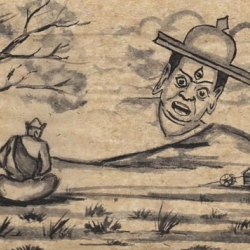 Before arise as a dharma protector, Namkar Barzin was a Mongolian geshe who suffered a traumatic death and later subdued by Kyabje Dome Geshe Rinpoche. 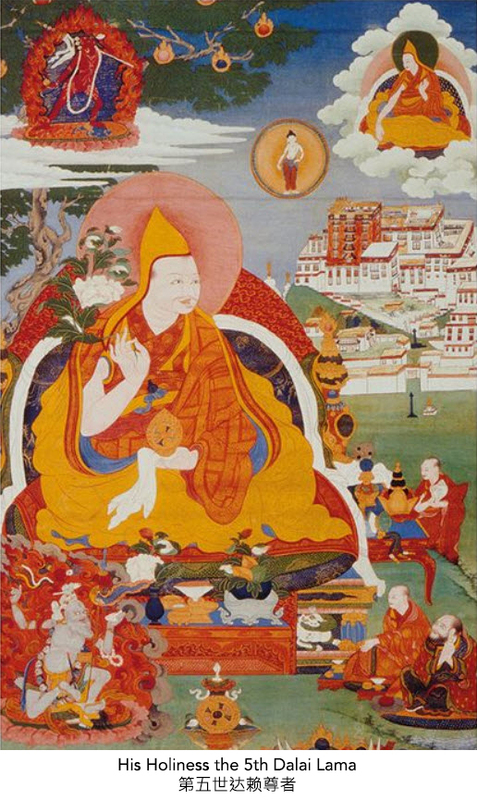 Due to Namkar Barzin’s strong guru devotion as followed Kyabje Dome Geshe Rinpoche’s instructions in helping Dorje Shugden and Dharma practitioners, Kyabje Domo Geshe Rinpoche made many images of him, spread his practice to many others and enthroned him as one of the protectors of his many monasteries. 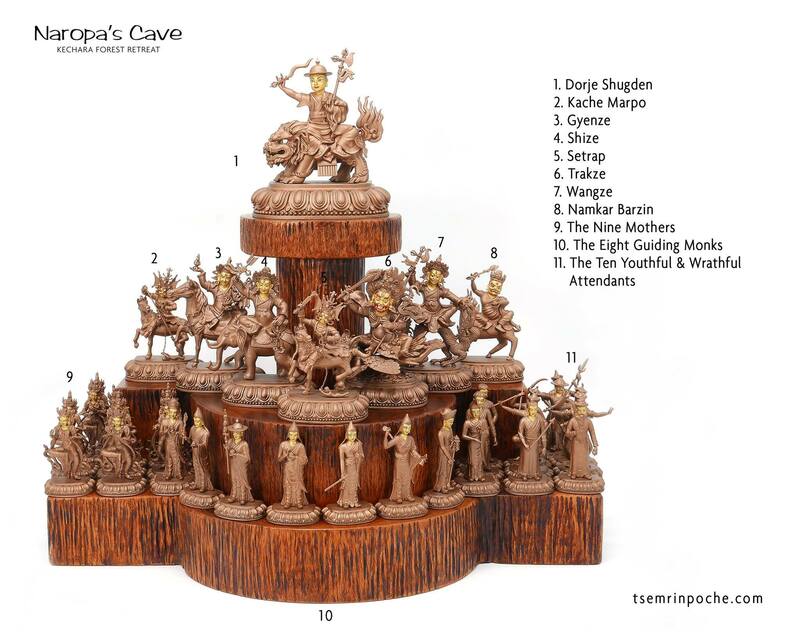 Thank you Rinpoche sharing this interesting story of Namkar Barzin. Thank you Rinpoche for sharing this article of your own experienced meeting Gangchen in Nepal and also meeting Protector Namkar Barzin in India. It is so blessed to meet the walking Medicine Buddha and also one of the ministers of Dorje Shugden. I rejoice to Rinpoche for meeting these holy beings personally. Thank you Rinpoche for the wonderful story of Namkar Barzin. I always love write ups about Dharma Protectors as i find their backgrounds very intriguing. And how Tsem Rinpoche met Gangchen Rinpoche. Wonderful!! 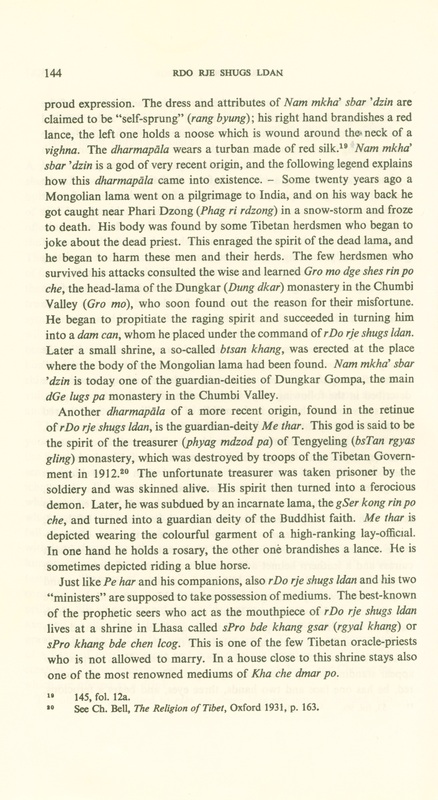 I note that on page 44 of RENE DE NEBESKY – WOJKOWITZ, (1956 – 1st print); Oracles and Demons of Tibet, The Cult and Iconography of the Tibetan Protective Deities; Book Faith India) featured above in this article, can be found details about Methar, the spirit of the treasurer of Tengyeling who was subdued by Serkong Dorje Chang and placed in the retinue of Dorje Shugden. May i request you, to teach us some practies about Namkar Barzin,plz.? I heard that Namka Bardzin is powerful in protecting properties and places. What is the reason you wish to practice Namka Bardzin? thanks for replay and question. Actually, to be honest, i don`t know, why i am more interested in some aspects of Buddhism than in other? In case of Namkar Barzin, i thought because he is the latest Member of the entourage of Dorje Shugden, that his practies contains: the best of what the masters has been compiled. 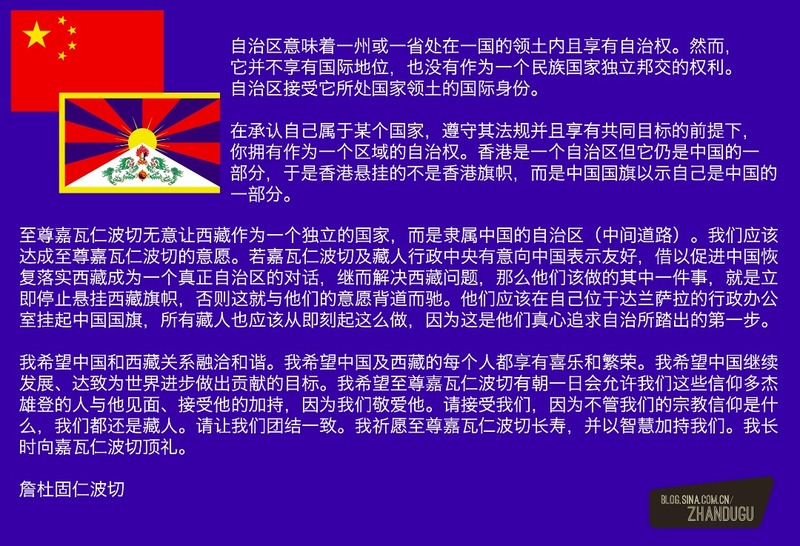 And I hope that Rinpoche will teach his online-Students in the futur. 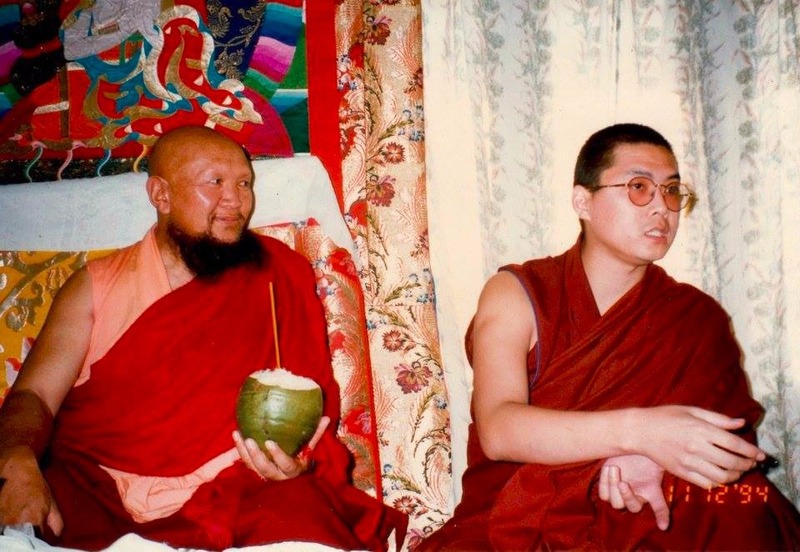 Tsem Rinpoche’s meeting with Gangchen Lama seems predestined almost magical. Gangchen Rinpoche previous incarnation built Borobudur, what an amazing beneficial being. Domo Geshe Rinpoche’s act of subduing Namka Bardzin is reminiscent of the Guru Rinpoche subduing the Pehar in times of old. 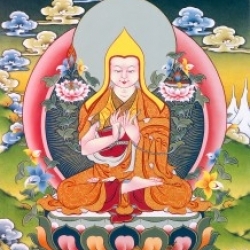 Domo Geshe kindness have earned him to be called an emanation of Tsongkhapa and people have also recited the mantra Domo Geshe Om Mani Padme Hum, which shows how much regard the people have for Domo Geshe. Thank you Rinpoche for sharing the story of how Rinpoche met Gangchen Rinpoche and Domo Geshe Rinpoche. I think may be because Rinpoche is half Mongolian and Namkar Barzin was also a Mongolian hence Rinpoche has very strong feeling for him. 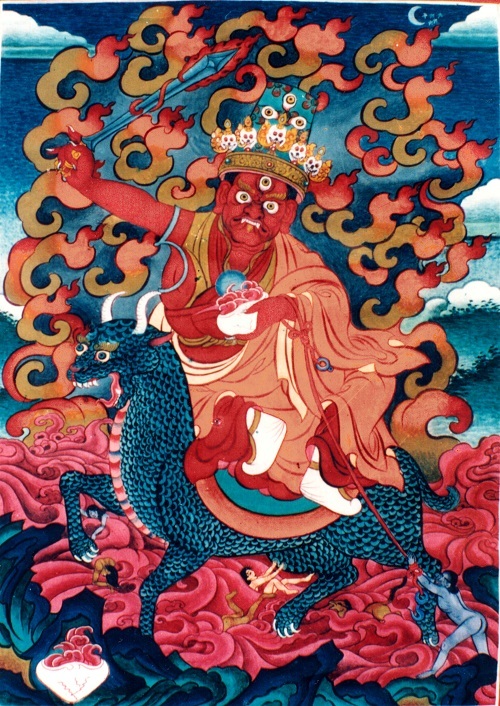 After reading the story of how Namkar Barzin transformed from a spirit to a protector, reminded me about how powerful a Lama that can transformed an evil spirit to a Dharma protector. Because of that Namkar Barzin is now helping all sentient beings simply through the Lama’s compassion. There was no fire puja needed. 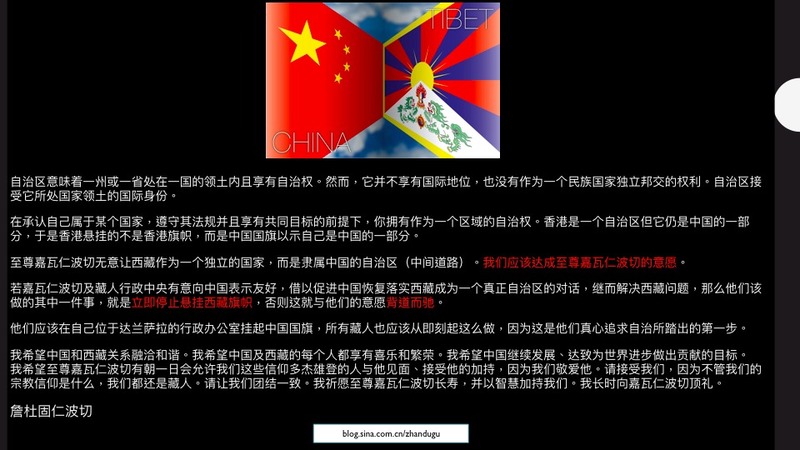 If Dorje Shugden is an eveil spirit why can’t H.H. Dalai Lama the compassionate Chenrezig do the same as Domo Geshe Rinpoche to transform Dorje Shugden to become Dharma protector? I do not believe HHDL do not has that power but I believe Dorje Shugden is already a enlightened Dharma Protector hence there’s no need for the HHDL to do so anymore. Thank you Rinpoche for sharing the story of Namkar Barzin with us. There are so much to learn, as we learn more, religion is not a superstition anymore, everything becomes so logical. We have to practice well now because even a well learned Geshe could become a spirit, let alone ordinary people like us. Dharma protector is important for us because we need him to remove our obstacles and purity our negative karmas so we can have a more conducive condition to practice. Thank you for the wonderful story of Namkar Barzin. It is always delightful to read or listen to Rinpoche’s stories and encounters. I always wanted to know more about Namkar Barzin, since he is part of the entourage for Dorje Shugden, and now I have the fortune to. on the page first article from middle to end. PS: Can anyone tell me, please is my Idea of improvised altar O.K.? 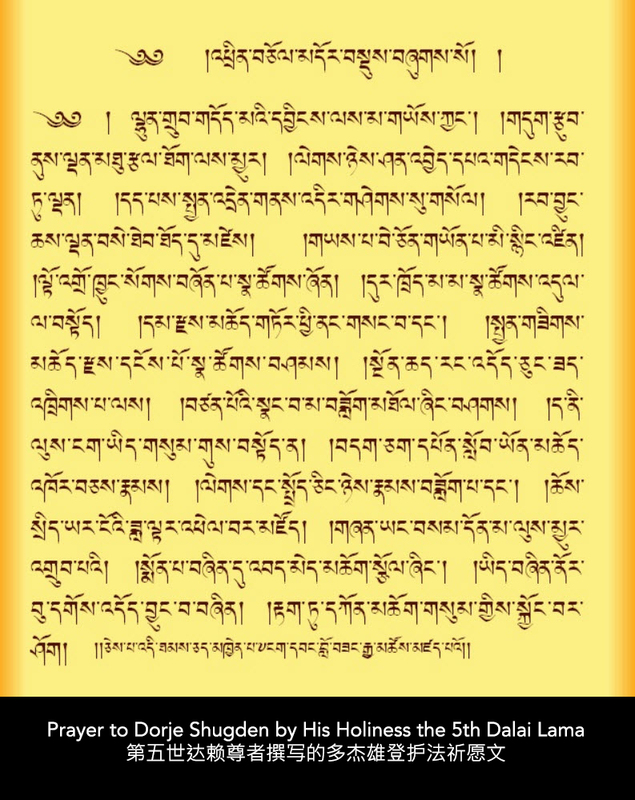 for praying the Invocation to Lord Namkar Barzin by Venerable Rinpoche? What to do with the offerings after the prayer? Greetings and I am not sure if you will receive this message and I hope that you will get it. 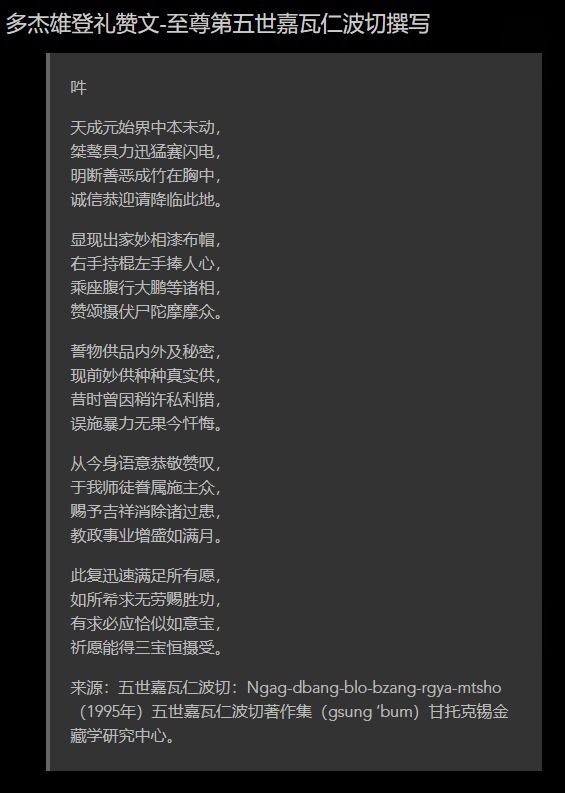 Unfortunately, the link that you shared no longer works and I am really curious to read about Lama Zopa Rinpoche’s encounter with Namka Barzin. It would be highly interesting to read. If I am not mistaken, Lama Zopa Rinpoche himself was recognized by Dorje Shugden, as according to his auto-biography Lawudo Lama. 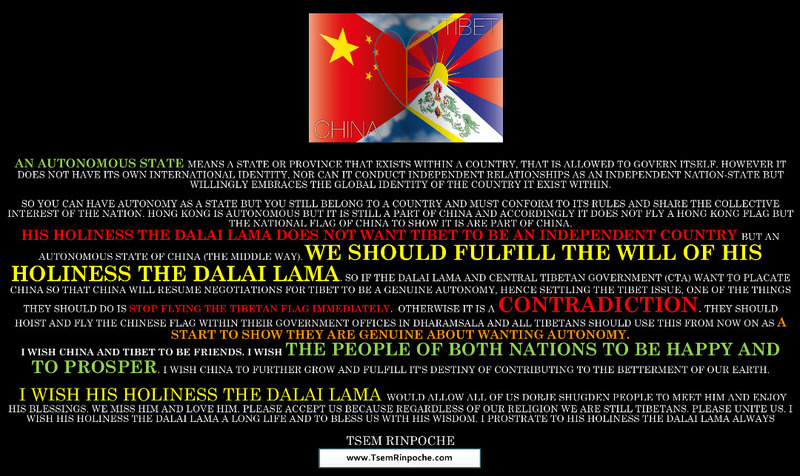 It’s just too bad that this fact is not open and that Lama Zopa talks against this protector now. I think it’s really interesting how this story turns about. It really amazes me how Kyabje Dome Geshe Rinpoche pacifies the geshe and allow him to be part of Dorje Shugden’s entourage to benefit others instead of terrifying others. And this is through Kyabje Dome Geshe Rinpoche’s compassion towards the geshe. Similarly, i’m really thankful that Rinpoche has post this story to benefit us all from his practice. Thank you, Rinpoche. Really looking forward to more interesting stories like this!! a short question: i have no altar, thats way i want to clean my desk,and then put a box on the cleaned desk then i will place the offerings on the box (candlelight, sweets, cakes, milk, yoghurt) light the candle and speak the prayer:Invocation to Lord Namkar Barzin by Venerable Rinpoche. and after the prayer, can i remove the offerings in order to use my desk, again? and what should be done with the offerings? Thank you Rinpoche for sharing the story of Namkar Barzin. 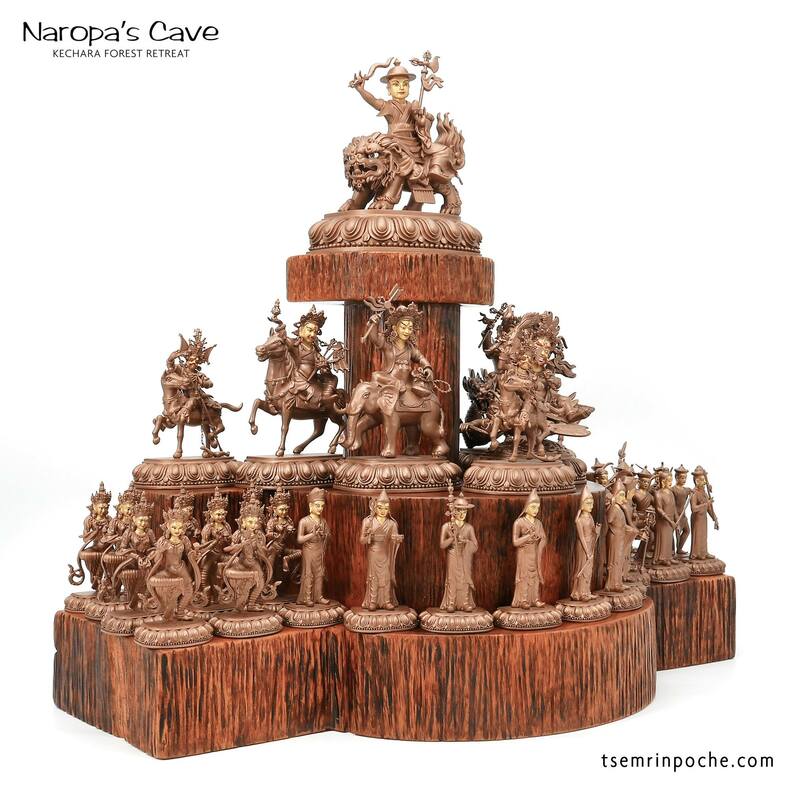 After reading the story and knowing more of Namkar Barzin and Kache Marpo, my faith for Dorje Shugden has even grown more as Dorje Shugden has powerful assistants and entourage to assist Him to protect and help the Dharma practitioners swiftly and effectively. In our current degenerate age, it is important that we need a Protector who is closer to our time so that we can easily receive help to clear our obstacles in order to stay on course along the spiritual path until we can achieve enlightenment and Buddhahood. May more and more people have faith in Dorje Shugden and His entourage in order to embrace the Dharma practice smoothly with much clarity of Buddha’s teachings and spread the love and compassion to all sentient beings. 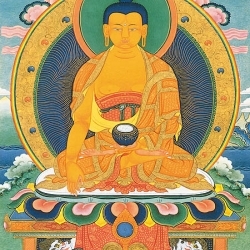 What stands out for me in reading the story of Namka Barzin is how anger and frustration (emotions encountered by Namka Barzin on death) can be turned into compassion and care and become a protector for sentients being and assist them in their quest for enlightenment. How powerful. Fortunately for Namka Barzin, there was a Great Lama, Kyabje Dromo Geshe Rinpoche, to help him to turn negative emotions to positive ones. And since Namka Barzin had huge Dharma knowledge, he obeyed. It is imperative that in this life time for us to totally trust and listen to our Guru and in the same manner we can transform our negativities to positive. Thank you so much for this article Rinpoche! Very informative. I love the paranormal and the unknown, so I especially appreciate all the information about oracles and Yetis! 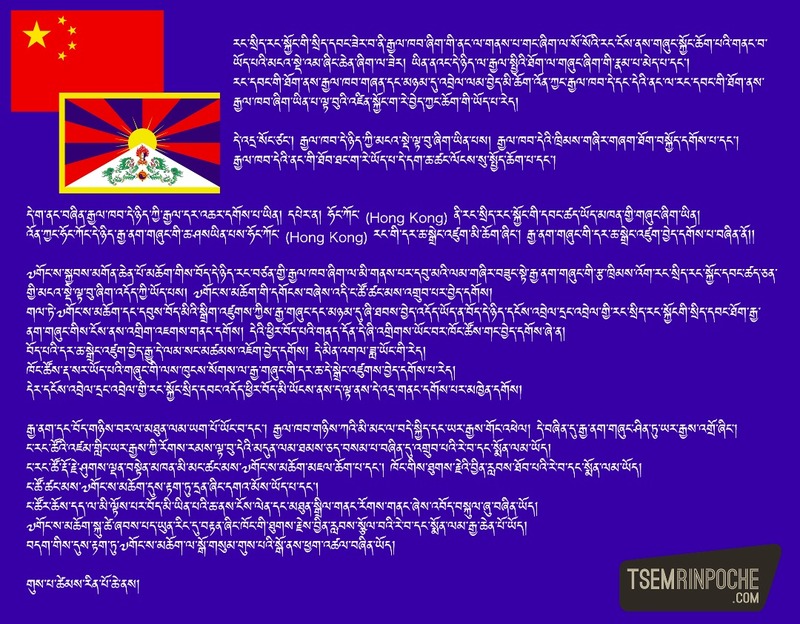 I have very little knowledge of this topic, but I believe I read somewhere that Namkar Barzin and Kache Marpo are considered worldly protectors versus enlightened protectors like Dorje Shugden. Does anyone know what the differences are between requesting from the two classes of Dharmapalas? Do they function differently? Thank you for clarifying for me! There is a difference between Kache Marpo and Namka Barzin. 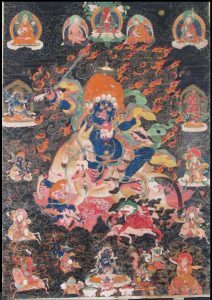 Kache Marpo manifests as a worldly protector but in actual fact an emanation of Hayagriva, the wrathful form of Amitabha. Whereas Namka Barzin is a worldly protector sworn under the oath to Dorje Shugden by Kyabje Dromo Geshe Rinpoche. 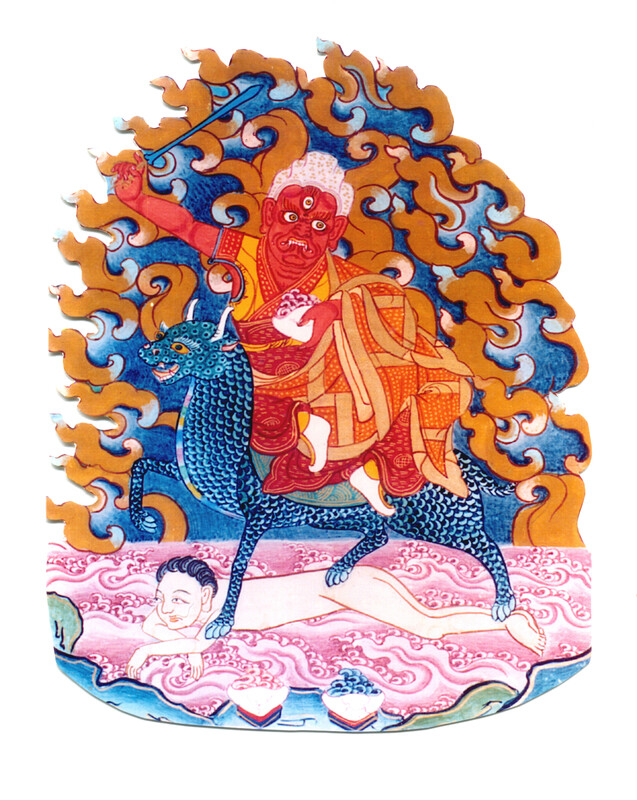 According to Kyabje Trijang Rinpoche, there are two types of Dharma Protector. One class is Enlightened and the other are unenlightened protectors sworn by oath by the high Lamas. 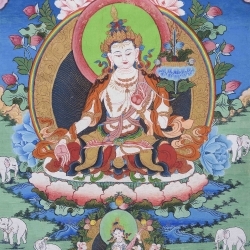 Within the class of Enlightened protectors, they appear in both supramundane and worldly form in order to help sentient beings. 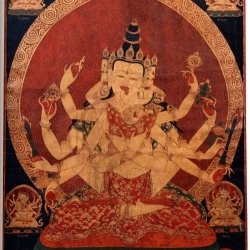 Examples of Enlightened beings in supramundane forms are Mahakalas and Kalarupa. 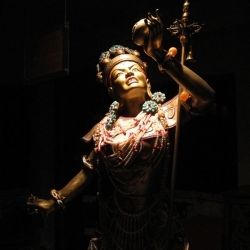 Enlightened protectors in worldly form are Setrap , Dorje Shugden and even Kache Marpo. Namka Barzin falls into the worldly class of protectors but a highly involved one. The fact that Kyabje Dromo geshe Rinpoche would praise him for his qualities and entrust him within the mandala of Dorje Shugden, he is no ordinary worldling. Enlightened protectors (be they manifesting in supramundane or worldly form) are fit for our refuge as they are direct emanations of Buddhas and Bodhisattvas. We can take refuge, make offerings and prostrations to them and gain merits from doing so. 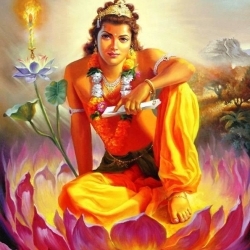 Their sole duty is to help clear obstacles and bring us to enlightenment. Worldly protectors are not fit for refuge and we cannot rely on them for enlightenment. We can propitiate them by making offerings to them like a friend giving a gift and asking a favour in return. They have limited abilities to help. hope this short explanation help. Thank you for your detailed explanation! You answered my question perfectly. Thank you as well for clarifying the nature of Kache Marpo, I would not have known otherwise. I very much appreciate your knowledgeable response! 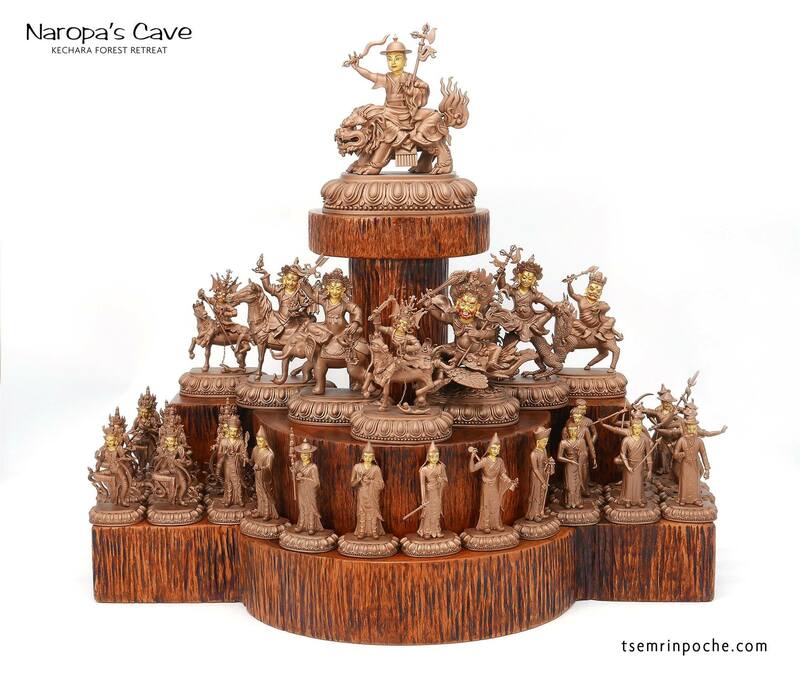 The entourage of Dorje Shugden is awesome. Each of them are such high beings. 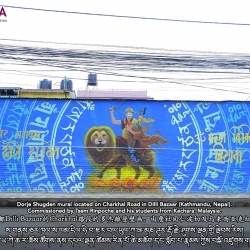 Both Namkar Barzin and Kache Marpo can be propitiated as Dharma Protectors in their own rights, yet they chose to be a part of Dorje Shugden’s entourage. 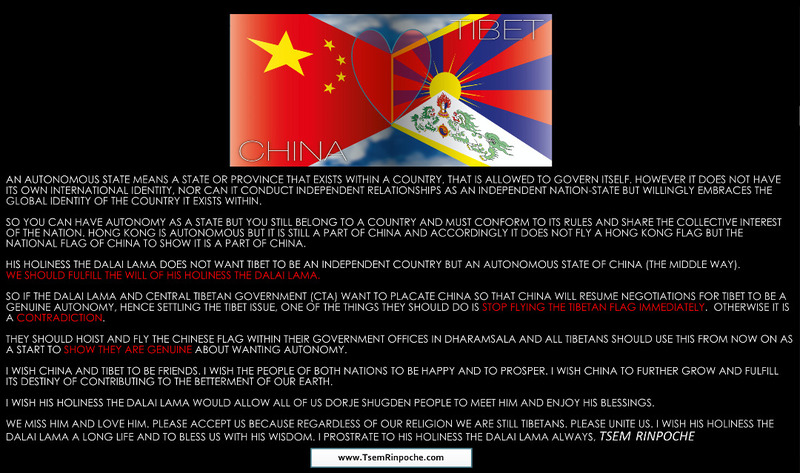 This says a lot about Dorje Shugden. What is also very amazing when reading these stories is that they are like Super Hero legends of special beings who pledged their life to “save the world”. These are real super heroes who works for decades and centuries to protect, bless and guide all of us if we seek their help. When I read these stories, it makes me wonder why we come up with virtual super heroes that further delude our minds? I am now excited to share the story Namkar Barzin with friends and introduce them to a real life super hero who was once a man devoted to the Dharma and decided to serve others by letting go of his anger and humiliation by developing wisdom and kindness. 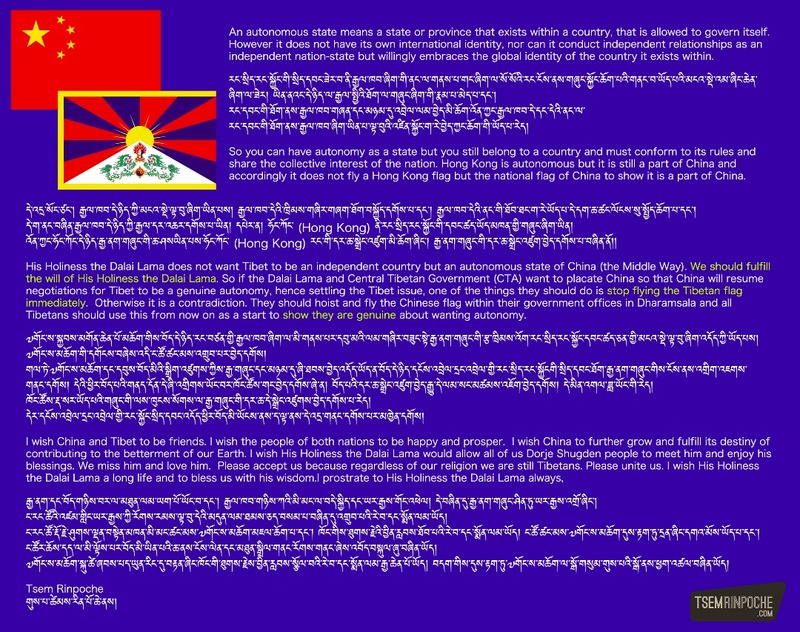 Thank you Rinpoche for this very interesting blog post of Namkar Barzin which is not readily available in such detail online. Thank you Rinpoche and the blog team for making more and more of these precious practices and commentaries and explanations available for people all over the world at the convenient tip of their fingers. I love reading Rinpoche’s personal experience, adventures and many interesting stories in India, Nepal and Tibet. Its more refreshing than buying a book. 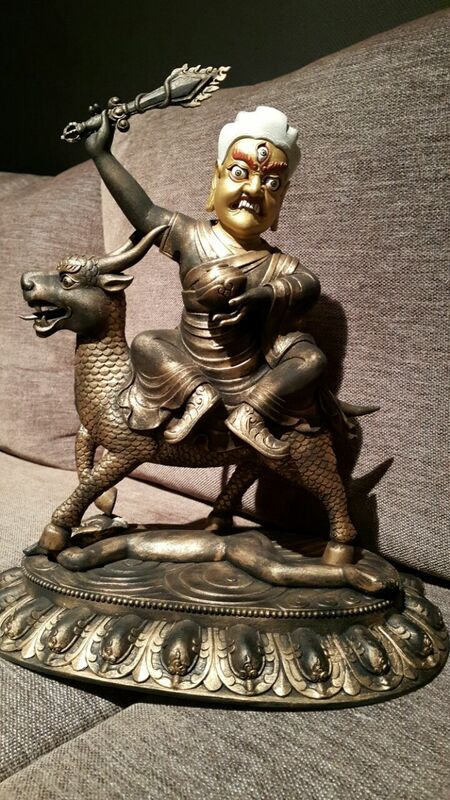 Thank you for sharing this wonderful dharma protector, and Domo Geshe Rinpoche :). So happy to read about both of them. Question though, because he is fairly recent, does that mean his blessings are swift for our time? 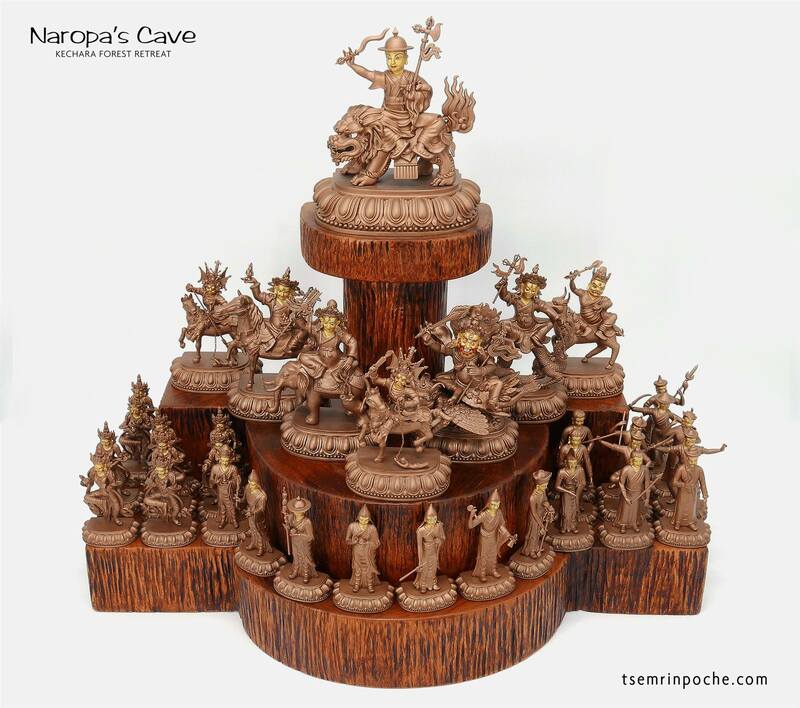 Dorje Shugden has many incredible beings on his entourage assisting Him in His works always.